Facing unemployment, loan debt, expensive retiree payouts and more problems, young people need a lobby. Over the next few weeks 3.5 million of you will graduate and try to find jobs. We’re sorry to tell you that achieving success will be more difficult than it was for your parents or grandparents. Not because you’re less intelligent, or lazier or less deserving of realizing the American dream. The primary reason why today’s graduates face a daunting future: Government is making life more difficult for you. The youth unemployment rate for those between ages 20 and 24 is 9.6%, compared with 4.5% for those 25 and over. But America’s double-cross doesn’t start when you receive your diploma. It has been going on since elementary school, with too many American children badly educated at schools where ill-qualified teachers are protected by unions. As a result, the U.S. has steadily dropped in international education rankings—to an estimated 27th in mathematics in 2012 among Organization for Economic Cooperation and Development countries, down from 23rd in 2003. For those of you who majored in education, guess what? When bad teachers can’t be fired, there are fewer job openings for you. Harvard economist Raj Chetty has estimated that replacing a teacher in the bottom 5% of skills with a teacher of average quality results in an extra $9,000 in lifetime income per student. Replacing the bottom 5% of the nation’s 3.3 million public-school teachers would have collectively increased the lifetime income of 2015 graduates by $31 billion. 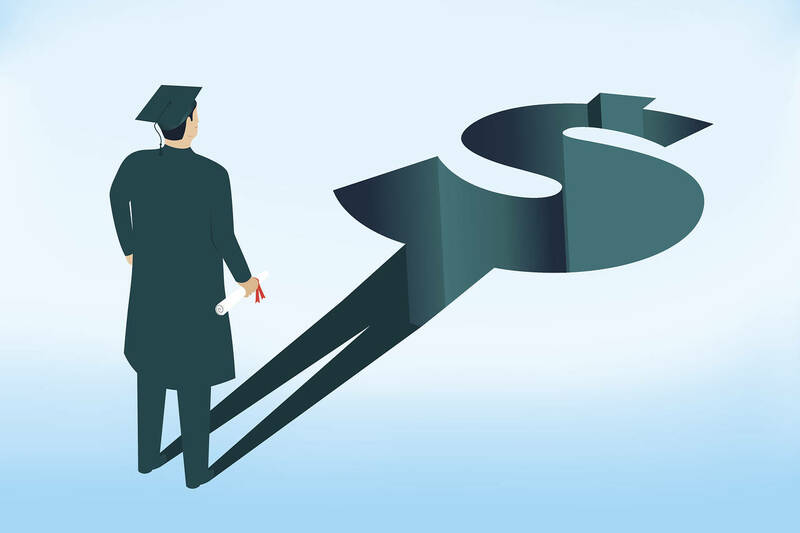 Seventy percent of you are graduating with student-loan debt, and your average debt is $27,000, according to the New York Federal Reserve. It is the current system of federal student aid that is raising your college tuition, and your debt will burden you for years after you graduate. It gets worse. After an inferior education and taking on thousands of dollars in debt, you will find that state occupational-licensing requirements will stop many of you from starting a business. These rules are said to protect public safety, but instead they protect established businesses and hurt you. Forget about starting a tree-trimming business in Alabama, California, Connecticut, Louisiana, Maine, Maryland or Rhode Island, because doing so requires a license. How the greenery in the 43 other states survives unlicensed trimming is a mystery. If you live in Florida, Nevada, Louisiana or the District of Columbia and want to be an interior designer, good luck: It will take six years of experience (and paying average of $364 in fees) before you can get a license. Even becoming an emergency medical technician is easier: You need to take an average of 33 days’ training and pass two exams. About those unpaid internships: Don’t count on one from a for-profit company in banking or publishing. These might provide a path to a permanent job, but they have been practically banned by the Labor Department. The government and community organizers, on the other hand, are still allowed to sign up unpaid interns. Let’s say you do eventually find work. Then you will start paying taxes, mostly to subsidize government programs that increasingly benefit middle-aged and older Americans, many of whom have jobs and assets. The average household headed by an adult 65 or older has nearly 50 times the wealth of the average household headed by an adult younger than 35. In 1984, when the Census Bureau started compiling these statistics, the ratio was 10 to 1. Yet programs to benefit older Americans, like Social Security and Medicare, increasingly are eating up the budget of a federal government that is $18 trillion in debt. Those two programs account for more than four dollars out of every 10 in the federal budget. Oh, and many of you will pay taxes to help out state governments that are among those facing a collective $5 trillion in unfunded liabilities, mostly from unfunded promises made to government retirees. You’ll even be expected to pay for the health care of older Americans with your higher health-care premiums under the Affordable Care Act, just so older people get to pay less. So considerate of you. President Obama isn’t to blame for all of this (except for the higher health-care premiums and the vanishing of unpaid internships). Most of these destructive policies began long before the current administration. Protecting the entrenched interests of the old at the expense of the young is getting to be a U.S. tradition. AARP, originally the American Association of Retired Persons, spent $25 million on lobbying in the 2012 presidential-election cycle and more than $16 million for the 2014 midterms. AARP consistently ranks in the top 1% of lobbyist spending tracked by the Center for Responsive Politics. With the extra time many of you will have on your hands after graduation, you might want to consider starting your own group to put pressure on Washington to change its ways: the American Association of Young Persons. Ms. Furchtgott-Roth is a senior fellow at the Manhattan Institute, where Mr. Meyer is a fellow. Their book, “Disinherited: How Washington Is Betraying America’s Young,” is out this week from Encounter Books.